Thinking about upgrading your old car into an outstanding new Toyota car, truck, or sport utility vehicle (SUV) from Westbury Toyota? Then now is the time to not only schedule a visit with our team of friendly, accommodating, and trustworthy automotive experts who can help pick out the perfect Toyota for you, but to also take advantage of our exclusive $250 trade-in bonus offer. 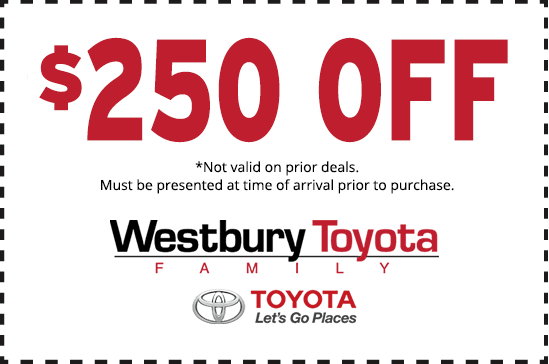 All you have to do to claim this amazing value is print out the coupon below and stop by Westbury Toyota with your trade-in vehicle when your are ready to enhance your daily driving routine. Before heading over to Westbury Toyota and claiming this trade-in special, please keep in mind that this offer is not valid on prior deals and must be presented at your time of arrival, prior to purchase. Outside of these two small considerations, there is nothing standing between you, a great value on your trade-in car, and the brand new Toyota vehicle that suits your unique automotive needs. To help get the wheels rolling on the process of finding the right Toyota for you, feel free to browse through our ample listing of outstanding new and pre-owned vehicles. Whether you find yourself enamored with the stylish Camry, the spacious RAV4, or one of our reliable and budget-friendly used offerings, we have no doubts that the right vehicle is waiting for you at the premier Toyota dealership in the greater Westbury NY area, Westbury Toyota.